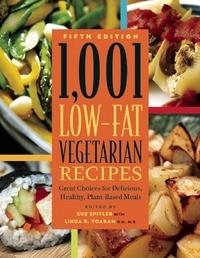 This new edition of 1,001 Low-Fat Vegetarian Recipes is an attractively packaged and easy-to-use update on one of the most popular and extensive vegetarian cookbooks. The introduction will adhere to American Heart Association guidelines and will include the new FDA nutritional guidelines, with comments on the importance of exercise as part of a total healthy lifestyle. These recipes are easier and faster to prepare with fewer ingredients and more concise cooking methods. Recipes that can be prepared in 30 minutes or less will be identified throughout the book with an "express veg" icon. The "super foods" that boast high nutritional, antioxidant, and phytochemical qualities will be emphasized in recipes -- blueberries, kiwi, pomegranate juice, melons, citrus fruit, edamame, leafy dark greens, broccoli, butternut squash, carrots, beets, tomatoes, bell peppers, beans and legumes, nuts, flax and hemp seeds, whole grains, and soy and dairy products. As in previous editions, recipes will include every recipe category from appetizers through desserts, with more than 500 entrees, offering a rich choice of satisfying vegetarian meals. Each recipe will be labeled with an identifying icon for vegan, lacto-vegetarian, ovo-vegetarian, and lacto-ovo-vegetarian. Nutritional data and diabetic exchanges are included for each recipe.